← Merry Christmas: past and present!! 18 June 2015 will mark the 200th anniversary of the Battle of Waterloo, one of the most famous battles in the history of Europe. The battle not only ended the political and military career of Napoleon Bonaparte but also ended the series of wars which had raged across Europe, and other regions of the world, since the French Revolutionary wars of the 1790s. 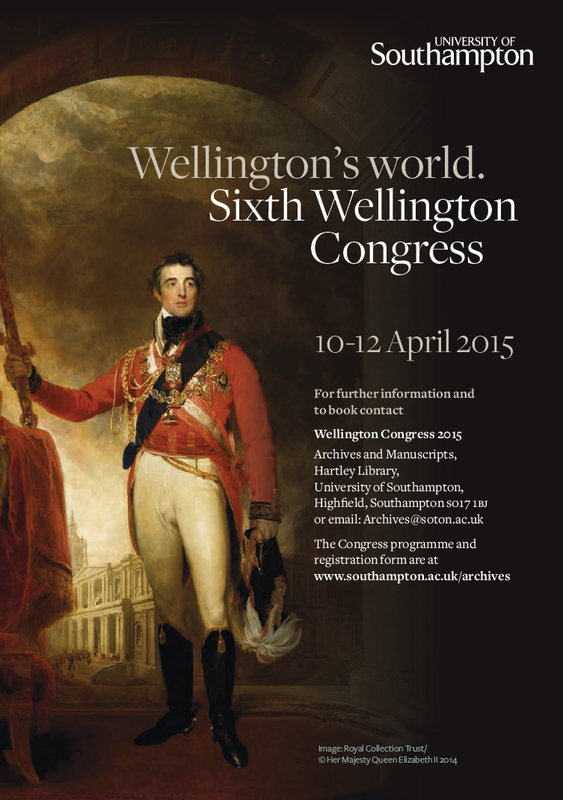 For the 200th anniversary the University of Southampton will be holding its Sixth Wellington Congress 10-12 April 2015. Papers will focus on a range of topics covering both Wellington’s military career and the battle of Waterloo as well as political, social and literary topics. Keynote speakers will be Rory Muir, Roger Knight, Will Hay and Chris Woolgar. On the Friday evening there will be a concert of music from the period at the Turner Sims Concert Hall. Saturday will feature a BBC Battles, Waterloo 200 presentation, a private view of the exhibition Wellington and Waterloo: “The tale is in every Englishman’s mouth” in the Special Collections Gallery, Hartley Library, and a conference dinner. The University’s Hartley Library is the home of the first Duke of Wellington’s archive, and the meeting will include opportunities to see the collection, as well as a programme of social activities. The event is organised in conjunction with the Southampton Centre for Nineteenth-Century Research. This entry was posted in Exhibitions and Events, Manuscript Collections, Wellington Congress and tagged Arthur Wellesley, Battle of Waterloo, Duke of Wellington, Wellington Congress, Wellington Papers. Bookmark the permalink.